BACH The 6 Cello Suites - Pablo Casals. 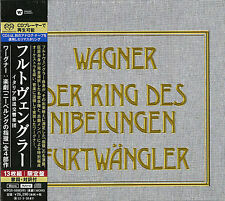 (SACD, 2011, Warner Classics Japan). Two Mono Hybrid SACDs. If they arrive cracked we advise just buying a new one for about 35 cents and replacing it. Pyotr Il'yich Tchaikovsky: The Nutcracker Suite, Op. 71a. Out of print RARE JAPAN 2 SACD Hybrid. Conducted by André Previn. Act II: Pas De Deux: Variation II: Dance Of The Sugar-Plum Fairy, Coda. WARNER MUSIC JAPAN WPGS-50104/5. JAPAN SACD Hybrid. Our specialized fields are in rare Japan. hard to find records and new Japan cds. 1 ITOSHI NO UNAJI. 3 IN THE GRID. The picture is for illustrative purposes only. the problem and make it right. This is a hybrid SACD so it can play on any CD player, but sounds best on a player that can read the high resolution SACD layer. It is in great condition all around. Sir John Barbirolli (conductor). Mahler: Symphony No. 9. Limited Edition JAPAN SACD Hybrid. Condition: New and sealed. Albinoni Adagio, Pachelbel Canon, Boccherini, Respighi (Single Layer). ArtistHerbert von Karajan (conductor) / Berlin Philharmonic Orchestra. 1 ADAGIO G-MOLL FUR STREICHER UND ORGEL. Catalog No. JAPAN SHM-SACD Ltd/Ed. CHIHIRO YAMANAKA(piano) Reminiscence (2011) JAPAN DSD mixing SHM - SACD w/OBI PICTURE SLEEVE Verve/UNIVERSAL MUSIC JAPAN UCGJ9002. number: UCGJ9002 (2011 Verve/UNIVERSAL MUSIC JAPAN). Feat．Bernard Purdie(drums) & Larry Grenadier(bass). Dvorak: Cello Concerto. JAPAN SACD Hybrid. ArtistJacqueline du Pre. hard to find records and new Japan cds. Our specialized fields are in rare Japan. since July 7th 2002. if your item had any problems such. This is a single layer SACD so it requires a player that can read the high resolution SACD layer. It has been played very little and is as good as new. 1 VIER LETZTE LIEDER 1. FRUHLING / Elisabeth Schwarzkopf. 2 VIER LETZTE LIEDER 2. SEPTEMBER / Elisabeth Schwarzkopf. 3 VIER LETZTE LIEDER 3. BEIM SCHLAFENGEHEN / Elisabeth Schwarzkopf. 4 VIER LETZTE LIEDER 4. 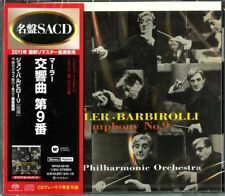 BRUCKNER - Symphony No.8 - Karl Böhm - Vienna Philharmonic (DG Japan SHM-SACD). DG Single Layer STEREO SACD, 2011. Will only play in a SACD compatible player. Karl Böhm - Vienna Philharmonic. If they arrive cracked we advise just buying a new one for about 35 cents and replacing it. JAPAN SACD Hybrid. Nine Stories. Our specialized fields are in rare Japan. hard to find records and new Japan cds. the problem and make it right. We must work hard to solve. We promise to work hard on. ArtistDinu Lipatti. JAPAN SACD Hybrid. Chopin: Waltz (No.1 - No.14). 1 14 WALTZES NO.4 IN F MAJOR. OP.34-3 'VALSE BRILLANTE'. 2 14 WALTZES NO.5 IN A FLAT MAJOR. OP.42 'GRAND VALSE'. 4 14 WALTZES NO.9 IN A FLAT MAJOR. 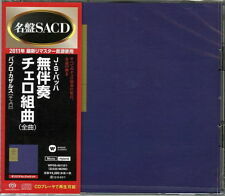 JAPAN 2 SACD Hybrid. Beethoven: Piano Concertos No.1, No.2 & No.4. 1 [Disc 1] PIANO CONCERTO NO.1 IN C MAJOR. ALLEGRO CON BRIO. 2 [Disc 1] PIANO CONCERTO NO.1 IN C MAJOR. 3 [Disc 1] PIANO CONCERTO NO.1 IN C MAJOR. ArtistHisako Kawamura (piano). Chopin: Piano Sonata No.3 & Schumann: Humoreske. JAPAN SACD Hybrid. 7 PIANO SONATA NO.3 IN B MINOR. ALLEGRO MAESTOSO. 8 PIANO SONATA NO.3 IN B MINOR. SCHERZO:MOLTO VIVACE. ArtistFumiaki Miura. Prokofiev: Violin Sonata No.1 & No.2. JAPAN SACD Hybrid. Japan Publications Trading. Our specialized fields are in rare Japan. hard to find records and new Japan cds. if your item had any problems such. ArtistIstvan Kertesz (conductor). Beethoven: Symphony No.4. 5 LEONORE. OVERTURE NO.3. 1 SYMPHONY NO.4 IN B-FLAT MAJOR. OP.60 1-ADAGIO-ALLEGRO VIVACE. 2 SYMPHONY NO.4 IN B-FLAT MAJOR. OP.60 2-ADAGIO. Bruckner - Symphony No. 7 in E SACD. Warner Classics - Limited Release SACD Hybrid Japan 2011. Wilhelm Furtwängler - Berlin Philharmonic Orchestra [rec. 18 October 1949 Dahlem, Berlin]. Our goal is to match artwork layout and CD label appearance. Carl Orff / Gundula Janowitz - Gerhard Stolze - Dietrich Fischer-Dieskau - Chor und Orchester Der Deutschen Oper Berlin - Eugen Jochum ‎– Carmina Burana. Conductor – Eugen Jochum. Composed By – Carl Orff. Bruckner - Symphony No. 8 in C minor (Original Version) SACD. Warner Classics - Limited Release SACD Hybrid Japan 2011. Wilhelm Furtwängler - Berlin Philharmonic Orchestra [rec. 14 March 1949 Dahlem, Berlin]. ArtistHERBERT VON KARAJAN. 1 LA TRAVIATA. VORSPIEL ZUM 3. AKT / HERBERT VON KARAJAN. 2 CAVALLERIA RUSTICANA. 3 SUOR ANGELICA. 4 I PAGLIACCI. 5 KHOVANSHCHINA. Title: Nightfly: SACD Hybrid. Artist: Donald Fagen. Format: SACD. Label: WEA Japan. Artist: Kaori Muraji. Title: Transformations. Format: SACD. Japanese only SACD pressing. Londonderry Air. Over the Rainbow. Farewell to Stromness. Variaciones Sobre El Carnaval de Venecia. Berlin Philharmonic Orchestra - Tchaikovsky: Symphony No. 3 'Polish' [New SACD] Japan - Import. Format: SACD. Japanese only SACD SHM CD pressing. Title: Tchaikovsky: Symphony No. 3 'Polish'. Artist: Berlin Philharmonic Orchestra. Bruckner: Symphony No. 3. JAPAN SACD Hybrid. ArtistGunter Wand (conductor). Release Date Our specialized fields are in rare Japan. hard to find records and new Japan cds. if your item had any problems such. Mahler: Symphony No.9. JAPAN 2 SACD Hybrid Ltd/Ed. 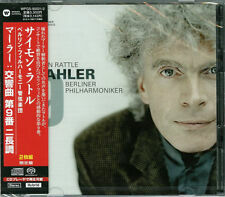 ArtistSimon Rattle (conductor). Release Date hard to find records and new Japan cds. Our specialized fields are in rare Japan. if your item had any problems such. ArtistRyusuke Numajiri (conductor). Toru Takemitsu: Orchestral Works, Vol 5. JAPAN SHM-SACD Ltd/Ed. Release Date 5 MUSIC OF TREE. Our specialized fields are in rare Japan. hard to find records and new Japan cds. ArtistSir John Barbirolli. 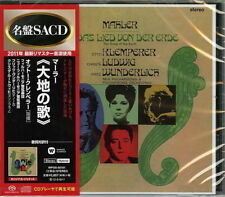 Mahler: Sym, 9, : Bernstein / Concertgebouw O. JAPAN SACD Hybrid. hard to find records and new Japan cds. Our specialized fields are in rare Japan. since July 7th 2002. if your item had any problems such. 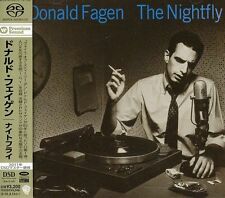 Model: Donald Fagen - Nightfly: SACD Hybrid [New SACD] Japan - Import. Artist Donald Fagen. We will provide best service! Masa Japan. Record Label WEA Japan. Model Warner Music Japan. New Arrivals. CASIO G-SHOCK. Bruckner: Symphony No. 8. 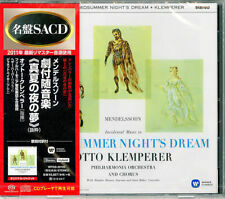 JAPAN 2 SACD Hybrid. ArtistGunter Wand (conductor). Release Date Our specialized fields are in rare Japan. hard to find records and new Japan cds. if your item had any problems such. ArtistRyusuke Numajiri (conductor). Artist Ryusuke Numajiri. Toru Takemitsu: Orchestral Works, Vol 5. Special Attributes SHM-CD,SACD. JAPAN SHM-SACD Ltd/Ed. Release Date 5 MUSIC OF TREE. Our specialized fields are in rare Japan.